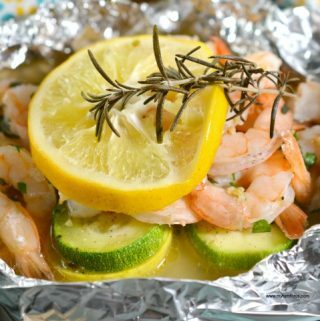 This Low Carb Shrimp Scampi foil packet meal is a complete shrimp foil packets oven meal and keeps cleanup to a minimum. 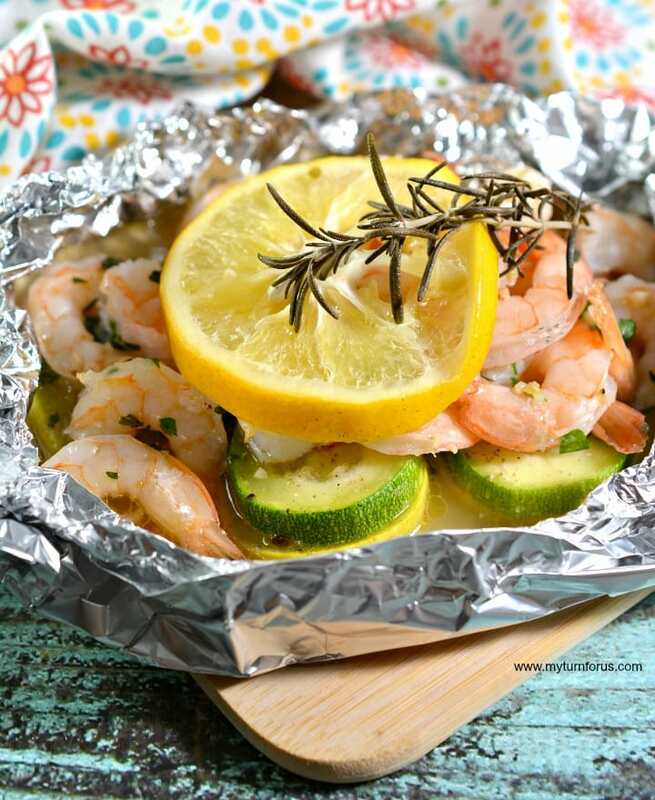 We love Foil Packet Dinners; they are so easy and quick and this is one you need to try. 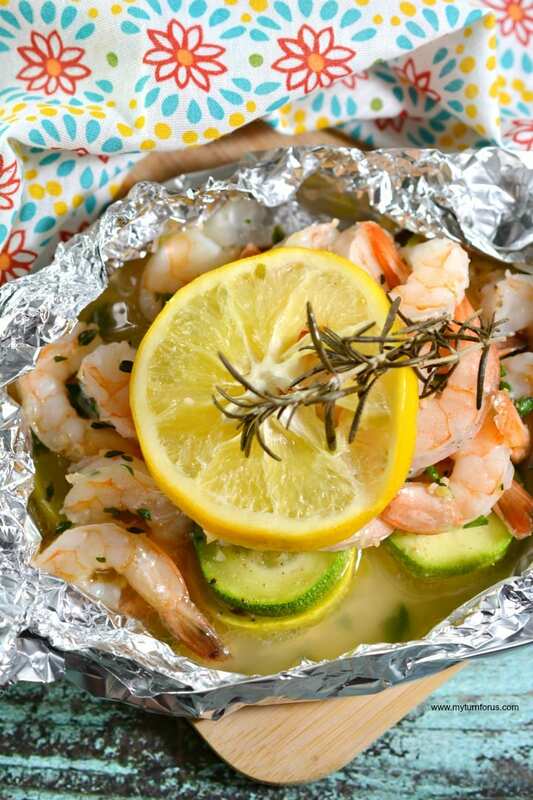 Foil packets dinners are so popular now, and we are jumping on the bandwagon. 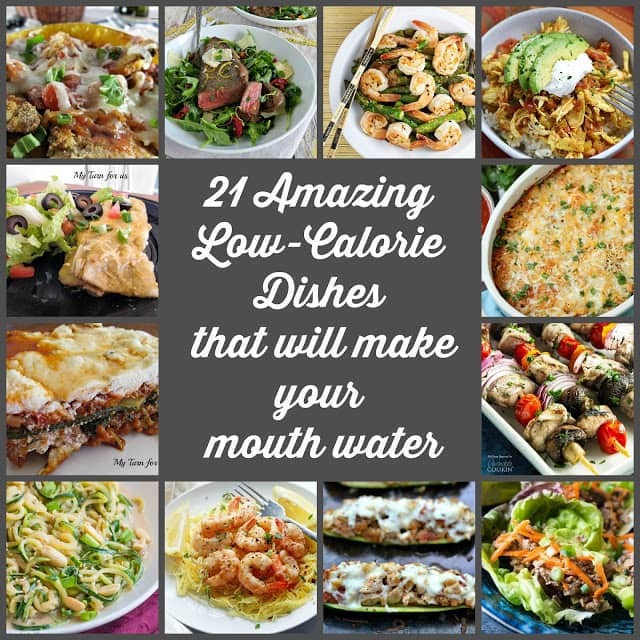 They are easy to put together and cook and no scrubbing pots or pans afterward. All you need is a few sheets of foil and you are set. 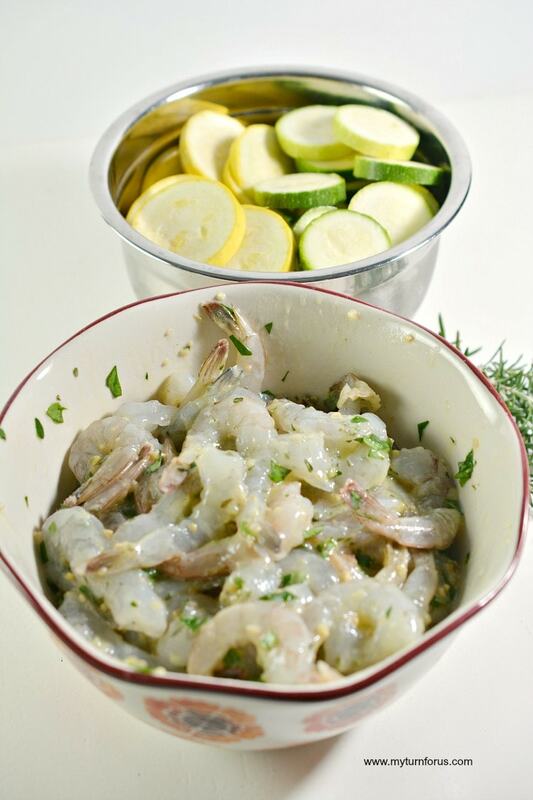 This Low carb shrimp scampi makes cooking a healthy meal easy and a go-to dinner idea for weeknights. It’s a shrimp foil packets oven meal that feeds a family of 6. It’s lightly seasoned and ghee can be substituted for the butter. And the addition of wine is optional but it’s only a little bit that cooks off and just adds flavor. So I say go with it. 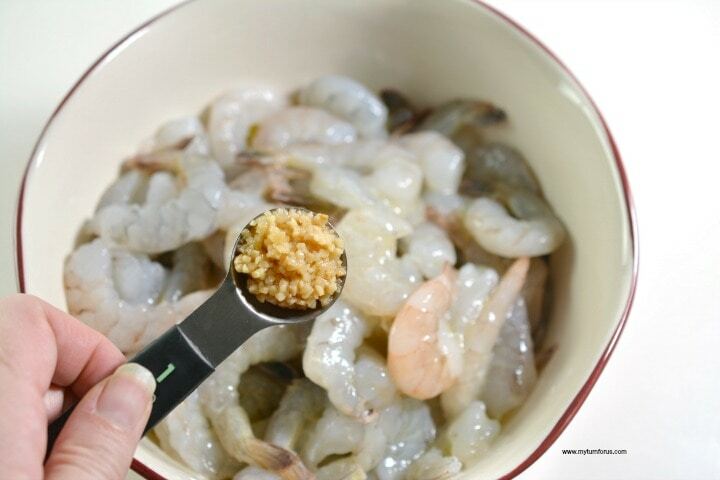 Start this lo-carb shrimp scampi dish by melting butter using a microwave butter dish. 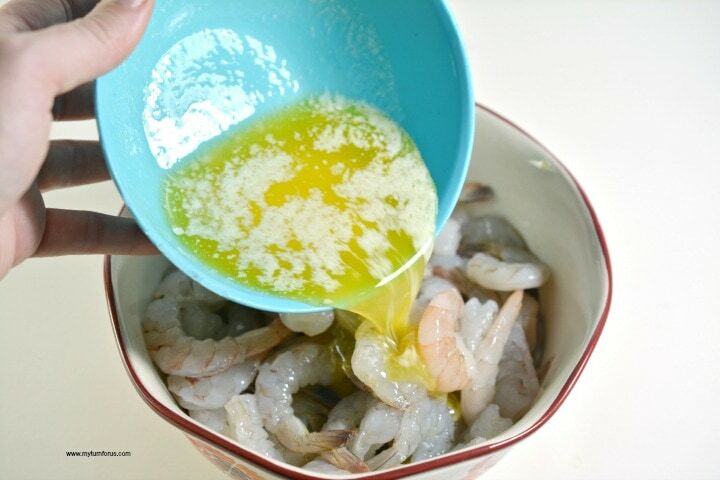 Place shrimp in a medium bowl and pour melted butter over shrimp. Add white wine to the shrimp and we use a drinking wine. 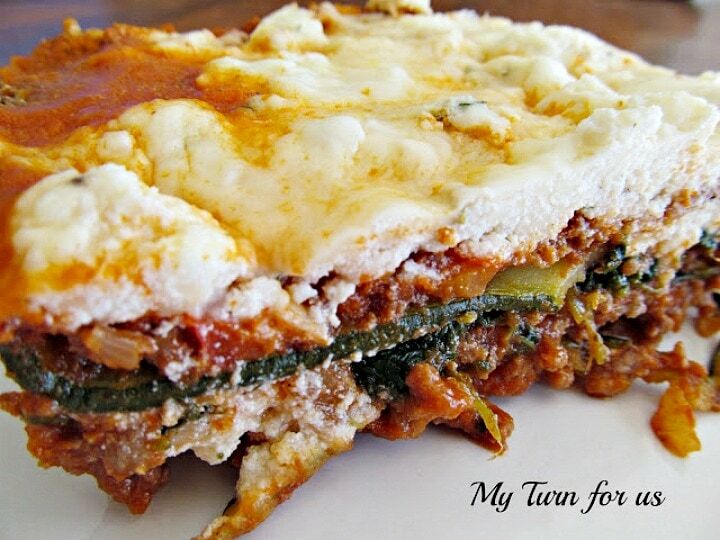 Our rule of thumb using wine in recipes is that if it’s our choice for drinking then it’s good for cooking. We really don’t buy a cheaper bottle to use in this recipe. 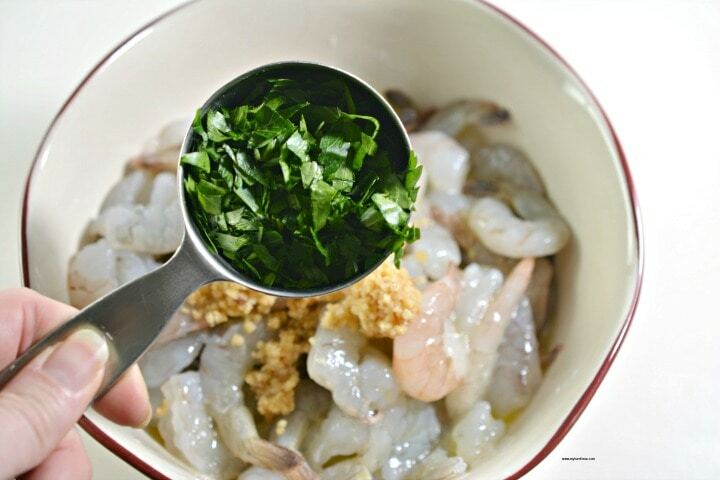 Add minced garlic to the butter shrimp scampi mixture. You could either use minced garlic from a jar or mince it fresh using this garlic peeler and garlic mincer. Add chopped fresh parsley and fresh thyme but dried can be used. If using dried herbs use 1/3 as much. The conversion for fresh to dried herbs is a 3 to 1 radio. 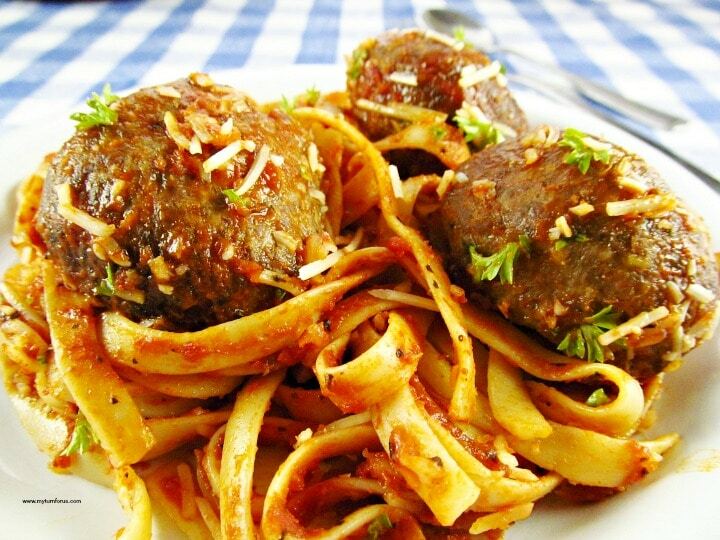 Dried herbs are much more potent so if 1 teaspoon of dried herbs is called for then use 1 tablespoon of fresh herbs. Gently toss to combine the seasonings in the shrimp scampi. 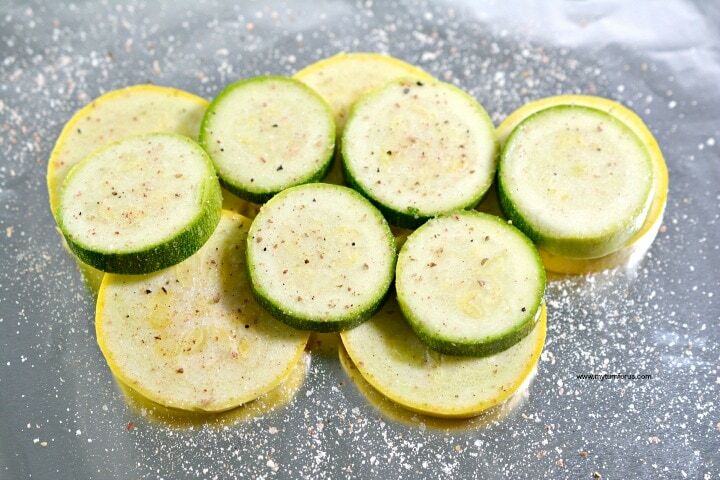 Use a mandoline to slice the zucchini and yellow squash into rounds. Tear off 6 sheets of aluminum foil about 15 inches long. Stack 6-7 of yellow squash slices and 6-7 slices of zucchini slices on each foil sheet as shown in the above photo. Season with freshly ground pepper and salt. 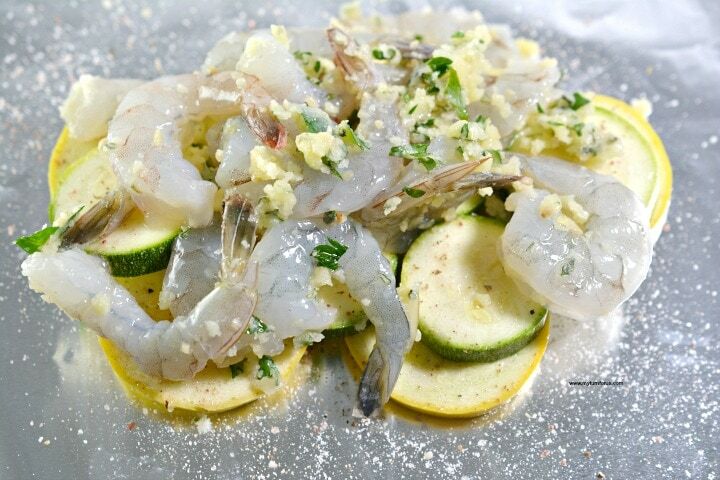 Add 1/6th of the shrimp scampi mixture on top of each stack of squash. It’s about a handful on each of the foil packet dinners. 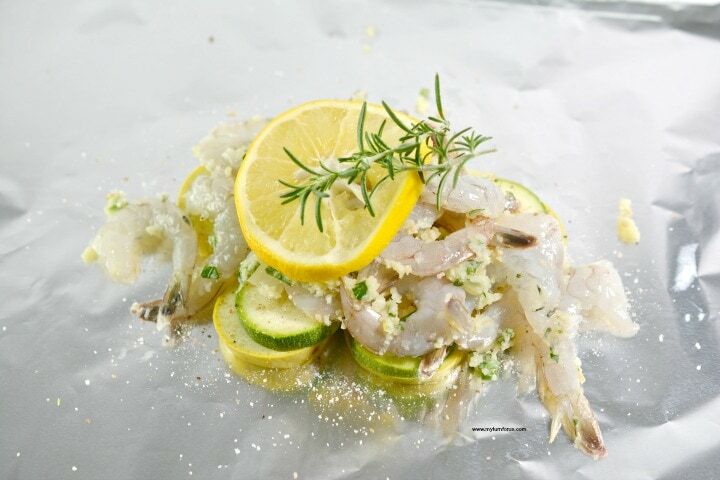 Place a lemon slice and a spring of fresh rosemary on top of each shrimp scampi foil packet dinners. 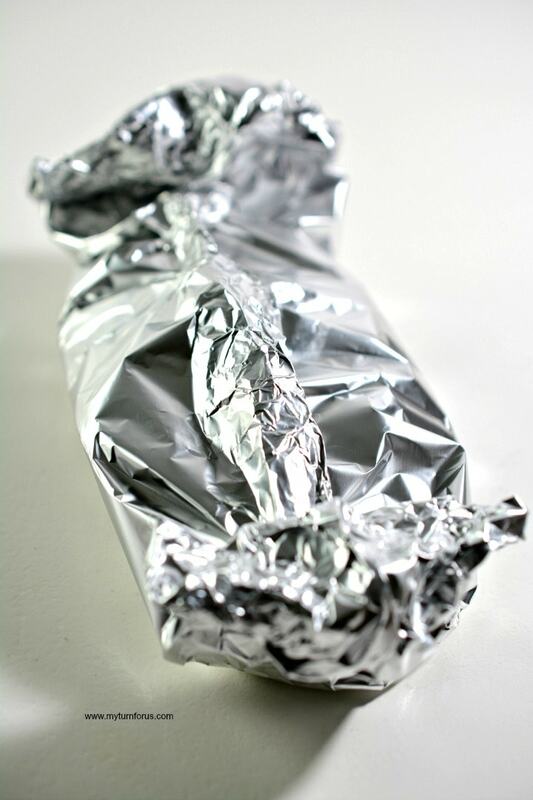 Fold up each side of the foil dinners then fold down to create a seal. Then fold up each end to seal them completely. Place in a preheated 400-degree oven and bake for 15-20 minutes until the shrimp is cooked completely and the veggies are tender. Remove from oven and open being careful not to burn, contents will be steamy and hot. 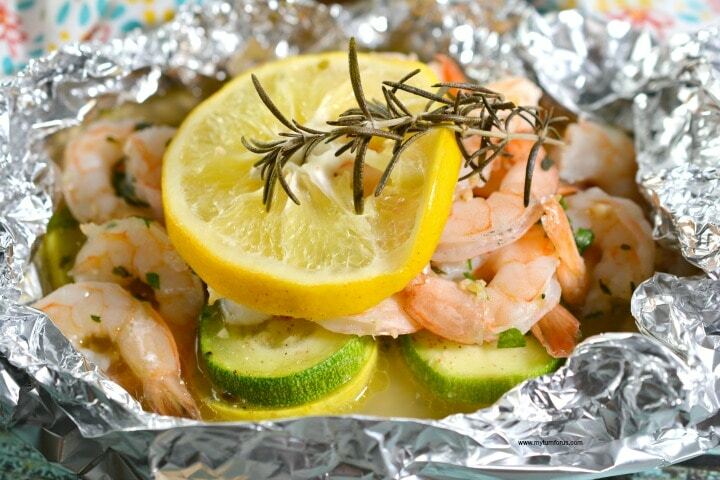 Serve right in the foil packets. 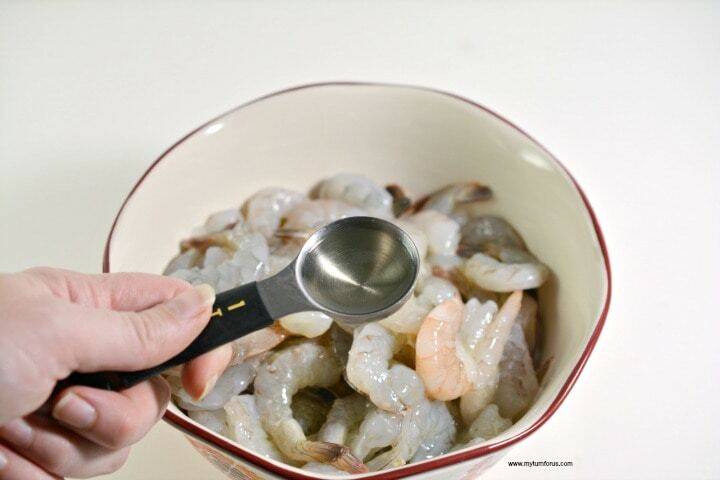 But if you would like to remove them, carefully scoop up with a spatula and pour juices over the shrimp scampi. 6 Sheets of aluminum foil about 15 inches long.